Joseph A. Dughi was born on December 23, 1893, in Raleigh, North Carolina, to Italian immigrants Antoine Leo and Louise Elizabeth Foppiano Dughi. Antoine Dughi worked as a street vendor, fruit vendor, confectionary store operator, and ice cream vendor. 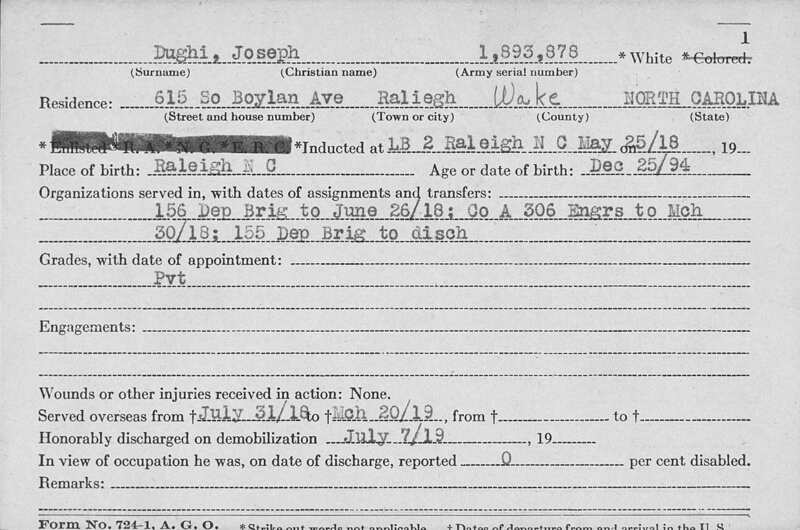 At the time of his draft registration for World War I, Joseph Dughi was listed as being an ice cream manufacturer (but was listed as a pipe fitter on his discharge certificate). Joseph Dughi enlisted at age 24 in the U.S. Army, and was inducted into military service on May 25, 1918. Joseph Dughi served as a Pipe Fitter with the 156th Depot Brigade through June 26, 1918. Later, he was transferred to Company A, 306th Engineers, serving with the rank of private. On March 30, 1919, Dughi was transferred to the 155th Depot Brigade, serving the remaining portion of his military service in that unit until his discharge on July 7, 1919. He served overseas with the American Expeditionary Forces from July 31, 1918, to March 20, 1919. Dughi was injured during the war in December 1918 in the St. Die sector, part of the Vosges Mountains region. He was noted as being hard of hearing in both ears, with 15% disability by the end of the war (though he was given a physical condition of “Good” when discharged, in keeping with military practice of the period). Following his service in WWI, Joseph Dughi is listed in city directories as a vendor and later a peanut retailer. He never married according to available records, and remained living in Raleigh for the rest of his life. Joseph Dughi died in Raleigh, North Carolina, on June 12, 1941, at the age of 47. He was buried in Oakwood Cemetery in Raleigh, in the Dughi family plot. 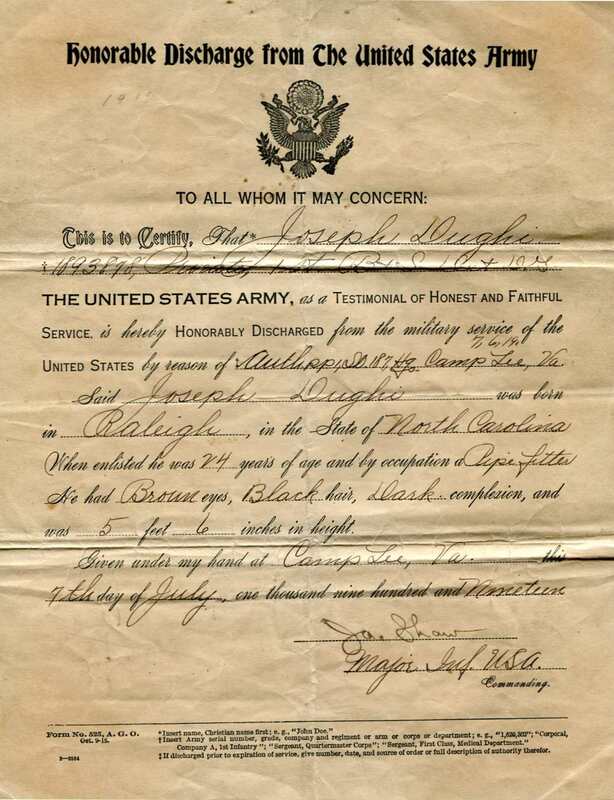 The only-known item from Joseph Dughi’s WWI service is his U.S. Army discharge certificate, housed in the collection Joseph A. Dughi Papers (WWI 25), held in the WWI Papers of the Military Collection at the State Archives of North Carolina in Raleigh, N.C.